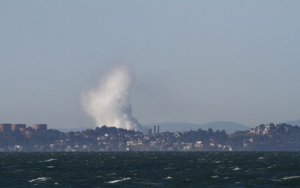 Accident in area Atex | Pipe rupture and fire in chevron richmond refinery. Hazardous Location. NFPA 496. On August 6, 2012, the Chevron U.S.A. Inc. Refinery in Richmond, California, (“the Chevron Richmond Refinery”) experienced a catastrophic pipe failure in the Crude Unit. The pipe, a 52 inch long carbon steel piping component of the sidecut line, ruptured and released flammable, hydrocarbon process fluid, which partially vaporized into a large vapor cloud that engulfed 19 Chevron employees and ignited. All of the employees escaped, narrowly avoiding serious injury. The ignition of the flammable portion of the vapor cloud and subsequent continued burning of the hydrocarbon process fluid resulted in a large plume of particulates and vapor traveling across the Richmond, California area. Approximately 15,000 people from the surrounding area sought medical treatment due to the release.